While the title is a bit “click baity”, it asks an important question that sheds light on some misunderstanding with regards to progressive overload. 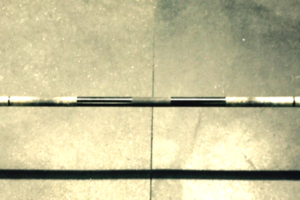 Is it possible to get jacked without worrying about adding load to the bar? When I was first starting to write about this topic, I posed the following poll question on my Instagram which ultimately supported my hunch that this topic is still grossly misunderstood. Now, I certainly don’t have the biggest Instagram following and I am willing to wager I have a greater percentage of powerlifters who follow me than bodybuilders. Based on that alone, I suspected there may be some overall bias in my sample considering the WHOLE POINT of powerlifting is to progress the load on the bar. I mentioned this to my buddy Alberto Nunez, who not only has a much larger following, but what is very likely a greater percentage of bodybuilders than powerlifters who follow him. So, he posted essentially the same question on his feed. Although our respective audiences likely explain some of the variance, to me it illustrated the need for continued discussion regarding progressive overload on a conceptual level. Most of us know that progressive overload is required for continual progress, but what is it exactly? On the surface it’s not a complicated concept. We induce a stressor that is sufficient enough to disrupt homeostasis, adapt to it, and then induce progressively larger stressors and continue to adapt to them on our way to a higher level of fitness (whether that be strength, hypertrophic, endurance, etc.) Eric Helms recently made an excellent video describing some of the misconceptions regarding how many define and conceptualize progressive overload. If you haven’t checked it out, I highly recommend you do so. To summarize a key point which I want to further discuss, progressive overload is not the action of adding weight to the bar per se but the progressing of imposed physiological stress over time that results in positive adaptation. I want to dig a bit more into this as I personally believe this is still a very misunderstood concept. A concept with implications that directly impact how we train, as well as providing a foundation for discussions and debates surrounding optimal program design as it pertains to hypertrophy. Our desired adaptations occur based on imposed stress at the cellular level. Load and volume progression are simply vehicles to take you there. Why does that matter? In order to best manage our volume and intensity within our programming, it’s important to understand how manipulations in these training variables actually achieve the physiological outcome we are after. But before we even dive into THAT, we need to objectively define what outcomes we are trying to impose. Overload is a broad term here. To be more specific, what does overload look like physiologically? By having a basic understanding of the physiological “objective”, we can better evaluate training strategies aiming to meet the objective of long term overload. Based on the size principle, muscle fibers are recruited on an as need basis to meet and/or maintain the imposed force demands[i]. In other words, additional muscle fibers are recruited as the load on the bar increases and/or as we fatigue and need to maintain our ability to move the weight. Therefore, when it comes to tension, tension is applied specifically on whatever requisite muscle fibers are active to meet OR maintain the current force demands. This is an important point since at each given load, the number of active muscle fibers is going to directly impact the magnitude of tension placed on each. Of particular importance here, light loads can still place large magnitudes of tension on muscle fibers when relatively few fibers are shouldering the load. In addition to this, the duration and magnitude of imposed tension is going to be impacted by the fatigability of each active muscle fiber. Remember, we recruit more muscle fibers as we fatigue. Taken together, the impulse (defined as force x time) experienced by each active fiber is primarily a product of the load and the duration of exposure to that load. For thoroughness, the force exerted by a given load on the muscle is also impacted by where one is within an exercise’s range of motion and the velocity at which it’s lifted. That said, this post by Chris Beardsley explains why high velocity strength training, despite high levels of motor unit recruitment, isn’t as effective for hypertrophy due to a compromise in mechanical loading. Before we go on, I think it’s also worth defining how “active” is used here. In order for active tension to occur, there needs to be overlap/attachment (cross bridging) between the contractile protein filaments. If there is no attachment, there isn’t any active tension induced on the muscle fiber. So, while the whole muscle belly may appear to be getting stretched (increasing passive tension), or shortened throughout the lift, there is only active tension placed upon the fibers responsible for meeting the eccentric and concentric force demands at each moment of time. When the magnitude and duration of tension is sufficient, a mechanically induced cellular signaling cascade occurs that drives an increase in muscle protein synthesis[ii]. There is no need to dive into the mechanism(s) through which this occurs, but it’s pretty cool in the sense that mechanical events result in a biochemical anabolic cascade. Over time, when synthesis exceeds breakdown we see net growth in the contractile protein filaments. When these filaments grow they produce more force when they contract. With the ability to produce more force, comes an increased ability to handle greater amounts of tension. With this increased threshold comes the need for a greater external stimulus to initiate the anabolic process again: a need for progressive overload. Based on what we have discussed so far, it should now make sense why, mechanistically, light loads can create equivalent hypertrophy as heavy loads. The “impulse threshold” can be met/surpassed (“overload”) in both cases, but one must push the lighter sets closer to failure in order to recruit the higher threshold muscle fibers as well as compensate with the additional time component of impulse. As a practical example, let’s say an advanced trainee has habitually trained with an average intensity of ~65-80% for a couple decades but eventually they decide to gravitate towards lighter loads since their joint integrity has become a limiting factor in their training. 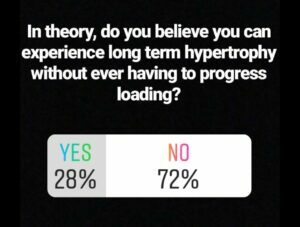 If there is any additional hypertrophy progress that’s observed after the switch to lighter loads, then that should tell us we don’t need to implement load progression to continue to grow. BUT their continued progress is still result of physiological progressive overload. Overload achieved by keeping relative intensity (effort) high, while accomplishing an overload in impulse. Now, I’m certainly not advocating against load progression, but I do believe that understanding some of the finer details of progressive tension overload allows us to better analyze the efficacy of different strategies and perhaps better plan our long-term training. So why progress loads? Again, Helms recently delivered on that topic in detail here. I’ll just note that since increased absolute intensity (load on the bar) increases muscle activation out of the gate, load progression is an efficient way to achieve similar levels of recruitment and subsequent fiber impulse without having to continuously perform more reps as your ceiling for failure inches further away. Plus, getting stronger is fun. I wouldn’t powerlift if I thought otherwise. In practice we should still aim to get stronger over time across a spectrum of rep ranges. It’s practical, it’s just not necessary on the physiological level for hypertrophy. That reminder can serve us well. Now, when it comes to strength, absolute intensity and load progression play a significantly greater role. Research clearly supports that increases in maximal strength are greater when training with higher vs lower intensities[iii]. While there have been some exceptions[iv], the subject’s training history and prior training structure likely played a significant role in the observed outcome as discussed by Dr. Mike Zourdos in his podcast with Sigma Nutrition. 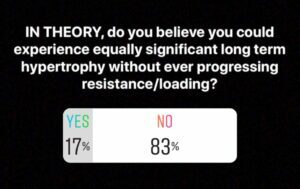 That said, I do believe that depending on the circumstance, a more conservative approach to load progression could potentially improve long term strength to a greater magnitude. This may be especially true in situations where joint health becomes the limiting factor in continued progress. This happens a lot. Based on both observation and personal experience, stagnations in strength are commonly a result of being sidelined with an injury/joint discomfort that is a direct result of higher intensity work and/or emphasizing load progression as the primary vehicle for overload. With muscular development being the one of the primary long term influences in expressing strength in advanced athletes, I feel a strong case can be made for structuring the majority of our training in a manner that emphasizes hypertrophy while minimizing wear and tear. Depending on the athlete, their injury history, and their competitive calendar, this could result in a decreased emphasis on load progression in these developmental/higher volume phases. In turn, a stronger emphasis on load progression could be left for the high intensity work that occurs in the more neurologically driven peaking phases before competition. For powerlifters who compete multiple times a year, they will fall somewhere in the middle ground as we don’t want to stray too much from being able to execute the competition lifts in a proficient manner at moderate to higher intensities. Point being, use a wide lens when selecting your loading strategies. You can still have a lucrative developmental phase of training while giving your joints a bit of a break. You may lose some skill in the main lifts at high intensities, but that’s not the primary objective of that phase anyway. Earlier I mentioned how volume and intensity are the primary vehicles through which we create the imposed training stress. Now that we know the imposed stress isn’t dependent on increasing loads, then one may assume its dependent on volume. Well, it’s not that simple either. The role of volume in creating overload can also be a bit confusing. Rather than take things at face value, it’s important to understand how observations are made, and recommendations are born. Around ~2012-2013 raw powerlifting saw what I would consider its largest boom of interest. During this time the sport inherited a lot of natural bodybuilders (myself included) who were looking for competitive outlets and ways to quantify progress in their extended offseasons. As any natural athlete can likely attest, the mirror is not the most reliable tool to quantify progress as noticeable visual improvements take a long time to occur and in advanced athletes may only be noticeable when you get back to contest shape. 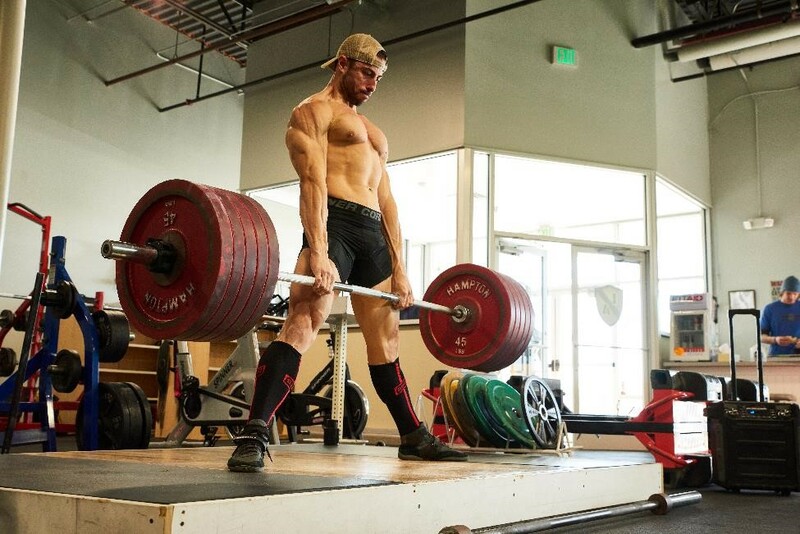 While it was certainly recognized that performance was a more reliable tool to objectively assess the efficacy of training, I think many athletes were still largely unsure if training like a powerlifter would compromise their growth potential. In 2014 Brad Schoenfeld published what I would consider one of the most influential papers to date relating to training volume, particularly in the “dual athlete” training community. In the study researchers compared a higher rep “bodybuilding style” program (3 x 10 RM) to a volume equated lower rep “powerlifting style” program (7 x 3RM) and examined both hypertrophy and strength outcomes. No differences were observed in muscle hypertrophy between groups, however the lower rep/higher intensity group experienced larger increases in strength[v]. These results seemed to be welcomed with a sigh of relief and soon after there were countless posts on social media starting with “They say powerlifting ruins physiques….” and each session’s tonnage boldly noted in the description. We could have our cake and eat it too! 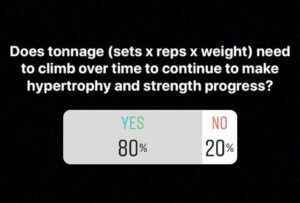 Jokes aside, I only bring this up because I believe that around this time is when the use of tonnage (sets x reps x weight) really hit the mainstream. A reductionist approach of simply equating tonnage for equal results started to surface. Let’s be clear though. Volume IS extremely important. A Schoenfeld 2016 meta-analysis demonstrated a dose response relationship between weekly sets and hypertrophy[vi]. However, with this awareness has also come quite a bit of misunderstanding. A lot of this I feel stems from the multiple ways volume can be defined. That can make or break the interpretation of the concept. That said, the most often used method of quantifying volume is likely tonnage (sets x reps x weight), as mentioned previously. Regardless of specific definition, volume should ultimately be thought of as the broad umbrella that training stress falls under. While overload isn’t reliant on load progression it’s also not predicated by reaching a threshold of tonnage within a session. Tonnage doesn’t cause hypertrophy. It just often correlates with the requisite stress that initiates the physiological cascade that gets us jacked. The practice of equating tonnage and expecting similar outcomes in hypertrophy often misses the mark due to the fact that load and proximity to failure are the primary determinants of muscle recruitment as mentioned earlier. Tonnage doesn’t provide insight into either of those. I think this is where the train really goes off the tracks in terms of interpretation. Many people associate this statement as a literal calculation that can be neatly packaged and quantified. That’s a bit tougher to quantify and track. In fact, it’s not terribly uncommon for elite level powerlifters to see an observed decrease in their tonnage as they progress in their career. The reason being, as they get stronger, each unit of work provides a greater absolute magnitude of imposed stress systemically. Programming 8 reps at 65% feels downright abusive for some lifters. Volume’s role in progressive overload is in creating sufficient tension exposure for fibers beyond what we are currently adapted to. Remember, there is a time component to impulse. While fiber activation seems necessary to maximize hypertrophy, it isn’t enough. From an anabolic standpoint, increases in training volume have a direct impact on the peak and duration of myofibrillar protein synthesis[vii]. That said, there is a point of diminishing returns when it comes to volume[viii]. Optimal volume management properly balances the stimulus with the requisite recovery to obtain it: a balance between fitness and fatigue. So…..the first step is recruiting the fiber and then performing enough work in that activated state to achieve the impulse we are after to elicit an anabolic response. Up to this point, one may deduce that recruiting the full spectrum of muscle fibers is simply a matter of using a heavy enough load or pushing a set close to failure. However, muscle activation is also governed by our recovery. Just because you take a set to failure or do some heavy singles doesn’t mean you reached your full capacity for muscle activation or as a growth stimulus. It simply means you recruited what your body “deemed available” based on your ability to meet the force demands on that given day. Following hard training one’s ability to generate force and perform work can be compromised for up to 4+ days following training[ix]. Remember, we activate additional motor units/muscle fibers to meet/maintain the force demands to begin with. So, performance matters in the sense that we need to perform well enough to achieve an overload. And we need to be recovered enough to do so. But an overload stimulus isn’t dependent on load progression which I feel is what most people naturally associate with the term “performance”. Put differently, your ability to add weight to the bar is an adaptive outcome from prior overload, NOT a requirement for subsequent overload. 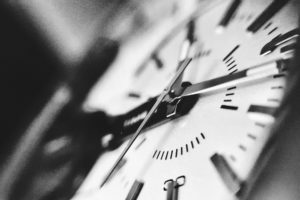 I thought this would be a cool topic to kick off this blog as it exposes some of the blind spots some of us may have when it comes to “chasing overload” and designing our strategies aimed at optimizing development and strength. There are a lot of tools to achieve our objectives and the key is using the right ones at the right time. For me, that’s where the fun in the program design process lies, and what I want to discuss more in the future. [ii] Schoenfeld, The Mechanisms of Muscle Hypertrophy and Their Application to Resistance Training. Great article Brian, I came here from Eric’s Instagram post. Looking forward to the next one!